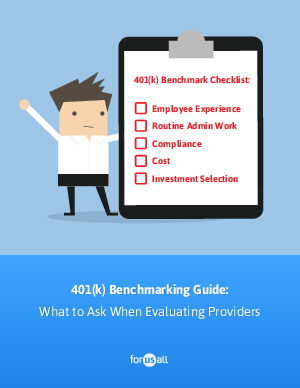 Select a 401(k) provider that saves you time, money, and minimizes your compliance liability. Most importantly, partner with an employee-focused 401(k) provider with a track record of helping more employees join and save in the plan — leaving you with happier employees and a 401(k) plan that makes your benefits package even more attractive. And as you evaluate providers, chat with someone from our team and check out our platform. We help our customers achieve 88% participation rates and save 8% on average.